"In marathon there is no such thing as sacrifice. The strongest runner in the race will always win. This is not track where tactics play a bigger role. We run for Kenya but we also run for our family. Knowing the economics of running, sacrificing yourself isn’t a very wise thing to do." - Kenyan Olympic marathoner, Emmanuel Mutai, in an interview talking about whether or not the Kenyans would try and use team tactics in London. We guess that's a no. 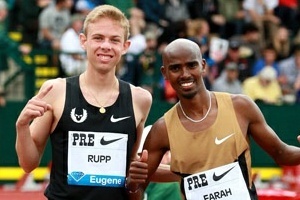 Cam Levins VO2 Max 62. Discuss. NRR: How much do you spend on vacation? 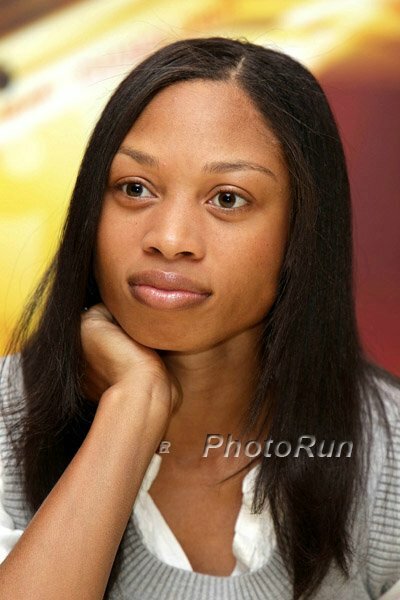 'Uneasy Tension' For U.S. Women's Hurdle Squad There seems to be some resentment by Dawn Harper that despite being the Olympic champ, she's always overshadowed in the media by Lolo Jones. A Few Years Ago Ryan Bailey Was Living Out Of A Car With His Mom, Hanging Out With Gang Members, and Failing School ... Now He's An Olympian "I sit back and think, 'Wow, I could be like a couple of my friends — in jail or dead. I could be right there with them. But I'm not." Stephanie Hightower Blogs On Olympic Trials In Eugene She's kidding herself when she said "these Olympic Trials were on par with any sport’s top tier event." 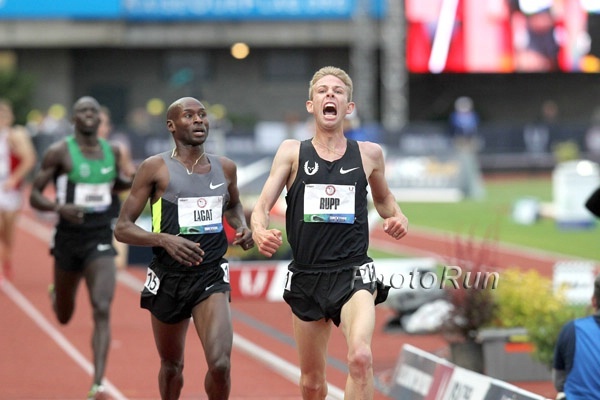 *Video: CNN Talks To Ryan Hall About His "Faith Based Coaching"
The American Distance Project Moves Forward After Successful Inaugural Year Established in Colorado by Renato Canova and Scott Simmons it includes Wendy Thomas, Alisha Williams and Joseph Chirlee. RunBlogRun.com Q&A: Julie Culley Her first running memory is running 4 or 5 laps around her house to "train" for the middle school race the next day. For All Those Nuts Who Think Running Is Bad For You: 56-Year Old Jerry Cahill Was Told He Might Not See 18 When He Was Diagnosed With Cystic Fibrosis As A Child He credits running and pole vaulting with keeping his lungs clear of mucus and strengthening his chest cavity. Mike Morton Wins Badwater Ultramarathon 70-year old Alan Webb finished 27th. Lignano: MB: Gabrielle Anderson Gets The "A" Her 4:04.84 came a little later than she would have liked, but she now has it for next year. 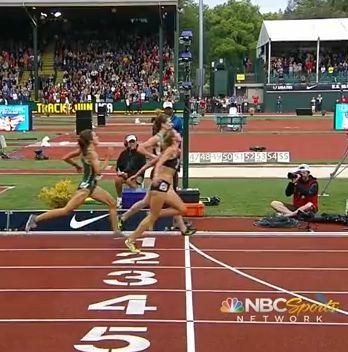 Emily Infeld & Sheila Reid miss at 4:07. Maggie Vessey (2:00.59), Anna Pierce (2:00.66). Ireland: Ryan Gregson (3:57.98) 1st, Ciarán Ó Lionáird (3:58.84) 5th In Mile, US 5k Olympian Kim Conley Wins 3,000 In 9:01.74 Liam Boylan-Pett (3:58.38) was 2nd and Elliott Heath third (3:58.48), while Ó Lionáird was overtaken by Ireland's newest sub-four man, St Coca's Paul Robinson (3:58.70) before finishing fifth in 3:58.84. 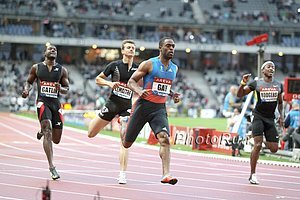 Italy: Oscar P Runs 46.56 In Italy But Says He'll Still PR (45.07) In London If he does PR, it shows he's got an unfair advantage as an able-bodied athlete wouldn't drop 1.5 seconds in 2 weeks. 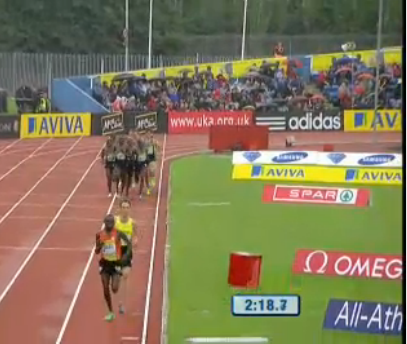 Understatement Of The Year: Colm O'Connell On Rudisha: "David is certainly one of the favourites in London." The article correctly mentions how Rudisha did lose to Aman last year. Rudisha on Aman: "Aman is a young boy, good, talented." Sally Pearson Sounds Unfazed After 100H Loss: "These girls only beat me while I was not at my best, but when I am on fire they can't come near me." Her coach also blamed her loss on a fall in wet conditions during her warmup. Kenyan 1,500 Ace Helen Obiri Says She's Going To London With One Goal - To Win A Medal In 1,500 But the press mis-represents her statement as saying she's confident shell win gold. 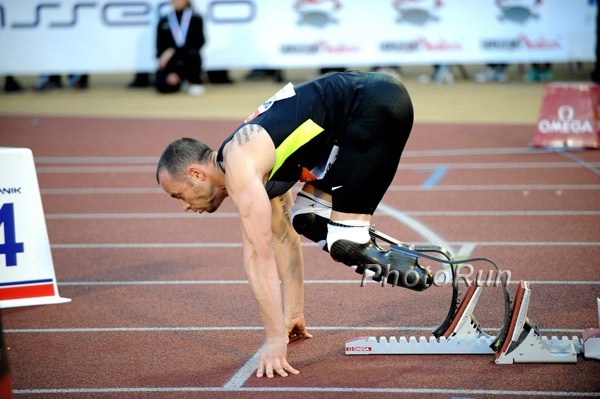 Are Track & Field World Records Reaching Their Physical Limits? Scientists say yes. Ramadan Coming Right In Middle Of Olympics And Many Athletes, Including Steepler Mohamed-Khaled Belabbas, Say They'll Fast Athletes from the UAE have nothing to worry about, as there is a fatwah giving them an out. 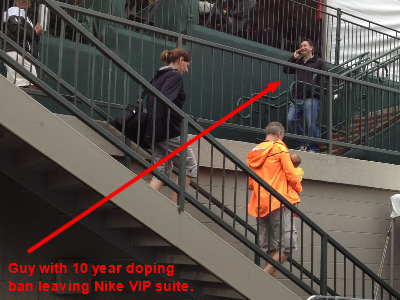 Kara Goucher Ranked As The 20th-Most Influential Person In Oregon Sports But we know the list isn't any accurate as Vin Lananna is only #23. One Option For Olympic Stadium After Olympics - F1 Race Track? Kerron Clement's Bus To Olympic Village Gets Stranded - He Tweets - Help We Need to Pee "Um, so we've been lost on the road for 4hrs. Not a good first impression London. Athletes are sleepy, hungry and need to pee. Could we get to the Olympic Village please." Reuters: Kenyan Team Needs "A Counsellor, Psychiatrist And Psychologist" To Resolve A Myriad Of Personal And Legal Issues Ezekiel Kemboi has been accused of stabbing a woman, while double world champion Vivian Cheruiyot's fiancé Moses Kirui has been taken to court by his ex-wife, marathon runner Caroline Kwambai, over maintenance of their three children. Meanwhile, two Kenyans who aren't even on the Olympic team somehow showed up in Bristol to get ready and even the AK head was perplexed: "How did they end up in Bristol?" *One Athlete's Response "In Kenya, nothing is straightforward." The 10,000 OT controversy, the men's marathon controversy, the Kemboi stabbing may seem like a lot but hey, this is Kenya. *Prime Minister's Wife Wrote Letter Defending Ezekiel Kemboi Kemboi claims the woman was stabbed by her own accomplices who were trying to rob him. Catriona Cuddihy's appeal against her deselection from Ireland's 4x400m relay team for the Olympics will be heard by the Olympic Council of Ireland Independent.ie She clearly isn't as good as the girl who wasn't initially selected. MB: Maybe it was her looks? Australian 400 Guy Cites Racism - Threatens To Drop Out Off of 4 X 400 If He's Not Nominated For Indivudal Event John Steffensen did beat his 19-year-old competitor at the Trials but neither has the "A"' so we could easily see why they'd run a 19-year-old over him. FIFA Head Steph Blatter Knew Of Millions In Bribes To Son In Law Blatter's defense: hey, technically it was legal. *Complete Day 6 Recap: Botswana's Nijel Amos Wins 800 By .77 Over Kenyan Olympian To Prove He's The Real Deal Olympic medal hopefuls, you'd better hope his "injured leg" is bad, as this guy is a medal threat in the Olympics if he shows up. Caster Semenya Says She Wants The Gold And WR In London A lot of confidence from someone who hasn't ran faster than 1:59 this year. She says she was motivated By Nelson Mandela during her "dark days" after Berlin 2009. 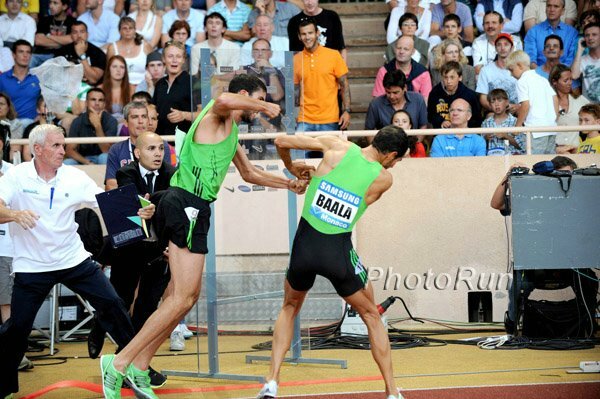 LRC A Fan's Guide To Monaco: Steeple Madness, Symmonds & Montano Hope To Get 800 Wins, Evan Jager Goes For the AR? The last DL meet before the Olympics should be a great meet, as a whole lot of stars want to get in one last good effort before the Games. 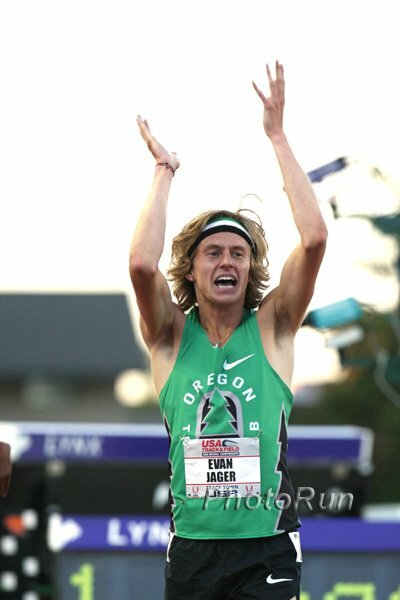 The meet features a world record attempt in the men's steeple and in our minds a US record attempt by Evan Jager as well, a great men's 1,500 with Kiprop, Chepseba, Centrowitz, Willis and others. 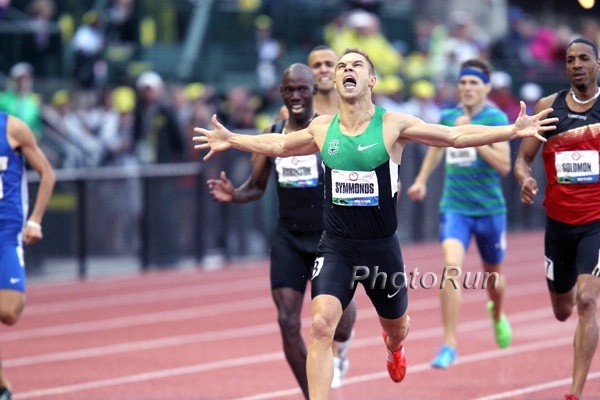 In the 800, US champs Nick Symmonds and Alysia Montano are possible winners. As for the rest of the action, there is flat women's 3000 with three US Olympians, a great men's 400, women's pole vault, men's high jump and a whole lot more, including the return of Jeneba Tarmoh. 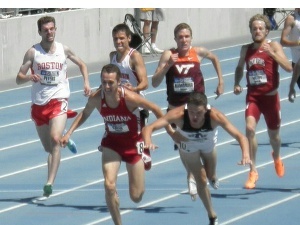 As good as it is, we say there is little chance it can equals last year's classic which featured a punch in the 1,500, a phantom punch by Solinsky, and a near WR in the steeple. 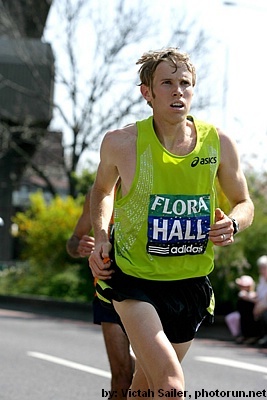 LRC Help Pick Ryan Hall's Shoes For the Olympics Asics made 3 pairs of specially designed shoes for Hall and he wants your input as to what he should wear. Going for it? David Rudisha: "Maybe this Olympics will be the first, where somebody will break 800m world record without pacemakers.” He wants to break the WR in London. Athletics Illustrated Q&A With Emmanuel Mutai "In marathon there is no such thing as sacrifice. The strongest runner in the race will always win. 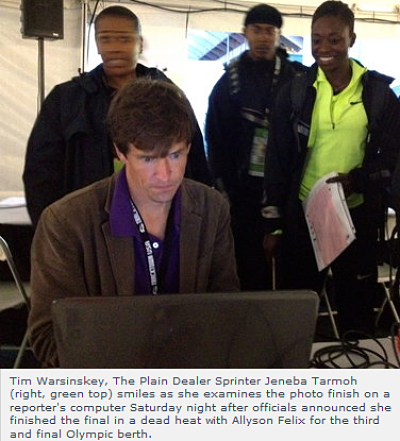 This is not track where tactics play a bigger role." Olympic Marathon Champ Constantina Dita Wraps up Main Training In Colorado And Heads To London She runs for Boulder Wave which has had the past 3 consecutive Olympic gold medals in the marathon. Crazy. Oscar P Shooting To Make The Semi-Final In London But he thinks 2016 will be his best Games. We'd normally say that's unrealistic since most sprinters peak in their mid 20's and he'll be almost 30, but then again, most sprinters can't simply replace their legs when they get older. 5 Questions With Genevieve LaCaze She celebrated qualifying with an Aussie Olympic tattoo. Oh Canada: After Being Denied A Spot On The Olympic Marathon Team Despite Having The "A" Standard, Lanni Marchant Trying To Prove Athletics Canada Wrong She ran 2:31:51, but didn't hit the stricter Canada standard of 2:29:55. So she wants to run that in the Toronto Waterfront Marathon to stick it to AC. Science Of Sport Guys - Did You See This? Oscar P: "I have a right to compete." Oscar's defense is almost disgraceful as he must know he's basically just not telling the truth: "Just because a guy's got a title of doctor or professor doesn't mean he has any knowledge in the field," and "you still get people who go for a certain angle because they want to keep it a controversial story." Blake On Bolt: "Win, lose or draw we are friends." Dai Greene Hasn't Lost Faith In His Ability To Beat Javier Culson "Six weeks ago in Oslo I was one second behind Culson yet six weeks later I was only 0.06 down. I regard Javier as the best in the world through the first five hurdles and I believe I am the best hurdler in the world through the last five hurdles." Liu Xiang Bolts London For Warmer Training Weather In Germany So much for hospitality? Cuba's Announces Its 47 Member Strong Olympic Track Team How many of them will defect? The Javelin Must Not Be That Hard: Javelin world champion Matthias de Zordo gets go ahead to train - says 3 weeks is all he needs to be ready for London Pole vault world champion Pawel Wojciechowski will try to prove his fitness this weekend. Kuwati's Suspension Is Lifted - 204 Federations Will Be at 2014 Olympics We say federations as there are only 196 countries in the world. Prior to this, individual competitors from Kuwait "could only participate under the Olympic flag with the title 'Independent Olympic Athlete." Learn About The Greatest Clutch/Heroic Olympic Story You've Never Heard Of - Olympics Retain Ability To Enthrall Imagine having to do a triple somersault dismount from 8 feet up on the gymnastic rings and land the dismount on a kneecap you know is broken. The result? A broken AND dislocated kneecap, torn ligaments in the leg, and a gold medal. 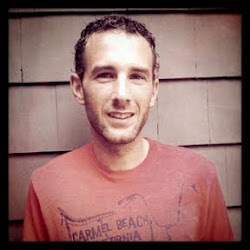 Learn About The Philosophy Of Dan Pfaff - One Of Two Coaches LetsRun.com's Wejo Has Ever Declared To Be A Genius "I believe that there is a way to do movement that's more correct than not, that's more efficient and lessens injuries. ... The way I see it, the further away you are from the model of excellence the more likely you are going to pay a price through inefficiency or chronic injury or inability to work as hard as your rival." Nick Willis: John Walker's 3:49.08 National Record Is One Of 3 Goals I Have Left In Track & Field The others: 1. Olympic gold 2. Sub-3:30 1,500 "I've never won a race where I haven't been in the top four coming into the bell, so if I want to have a chance of winning London, I have to be in the top three or four with 400m to go." Caster Semenya Also Wants The World Record At the Olympics "It's a very simple plan - to win my first Olympic final in a world record time,"says Semenya, who used to survive on £10 a week with her grandmother. Great Column By Eamon Sweeney: There Should Be Resignations In 4 X 400 Mess-Up In Ireland In Ireland, a slower woman was picked for the 4 x 400 team until an appeal was filed and the initial decision was overturned. The columnist points out the "mistake" should never ever happened in the first place and people need to give explanations or be fired. Fantastic New Documentary from Ireland - "It's Not The Taking Part" - Follows 8 People As They Attempt To Make The Olympics What if your best just isn't good enough? London Olympic Track Package Ludus tours was started by two former track and field stars and they've got accommodations very close to the track in London. The Olympics likely won't be in London during your lifetime again. Don't miss this opportunity. Other packages available. Mention letsrun and save $100. 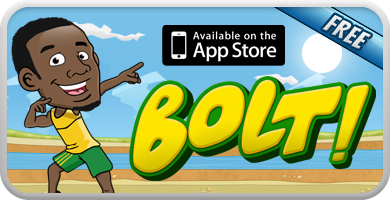 Is Usain Bolt High Maintenance? Usain Bolt Orders Special Orthopedic Bed To Sleep In At His Training Base In Birmingham He's been having hamstring issues since the Jamaican Trials. 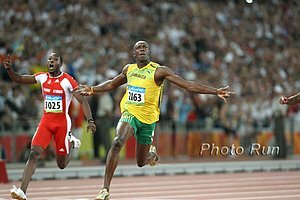 Bolt Buys Olympic Starting Blocks To Practice Before London More than you ever wanted to know about the new different Omega starting blocks. Complete Day 6 Recap: Botswana's Nijel Amos Wins 800 By .77 Over Kenyan Olympian To Prove He's The Real Deal Olympic medal hopefuls, you'd better hope his "injured leg" is bad, as this guy is a medal threat in the Olympics if he shows up.